I absolutely LOVE the results!!! I know I say that a lot, but this one, oh boy! I want to make at least three more versions of it. It would look good in lime green and white as a baby quilt. It would look fun scrappy! It would look good with one single orange background. And...well, you get the idea! I pieced the back using 3 different 1/4 yard cuts of orange and plenty of cream fabric. I really like the way it turned out. I LOVE the scissor fabric! It's Half Moon Modern, by Momo for Moda. I think that it's funny that they are "fiskars orange". That's not the official name, of course, but that's what they remind me of. For the quilting....I started stippling it, but it looked horrible. I ripped out the stitching and switched gears. I decided to echo quilt around each x and + with my walking foot. That worked SO much better. I had to turn the whole quilt in my machine at every corner, but it was so worth it. At that point, I was so glad I hadn't made the quilt any bigger! For the binding I used these fabulous dots...Mingle in Tangerine by Robert Kaufman. Mmmm. When I saw them I knew they were going to be perfect to finish off this quilt. They make me smile. My youngest son came up with the name for this quilt. He saw the sketch I had done and said "that looks like math facts". I loved it, so the name stuck. The quilt measures approximately 60" x 76". I wrote up a pattern for this one, which is available for sale in my shop. I stalk your blog because you are always doing such great projects and this one does not disappoint. Darling. Thanks for sharing all you wonderful talent. This one makes me (almost) like math ;) Very cool, Amanda Jean! ooohh, this is so great! I love it. That's really neat. I love the colors and the design. The back is awesome, and the polka dot binding is terrific! Such a creative happy quilt! Yay for you and for your son choosing the name. The quilt makes me smile! Nice!! I think it'd take me a lifetime to ever get that many different orange fabrics! Love, Love, Love it. Orange is a color people are afraid to work with and this is just stunning. You are a true inspiration. this is so cute!!! Makes for fun movement. Love, love, love love, love this quit - great design, brilliant color play! Perfection! I love everything about this quilt - the front, the back, AND the binding! So fun! This quilt is beautiful. It makes me smile and I love it. Ack! How can I not make this quilt? It's fabulous! Fantastic! Love the orange and white and I have to say, I prefer your version to Oliver's. :). I've been trying to collect more orange fabric. It's such a great color. You may not know it, but scrolling with the down arrow makes the math facts SPIN around! Another home run CrazyMom! I love it -- you're brilliant! I just ordered a bunch of the momo lime green dots -- they'd be perfect for a lime green version! Fabulous quilt! I absolutely love the orange - I think that's my color this year.... And if my math genius niece sees this one, I'll be making one for her, for sure!! Love it!! 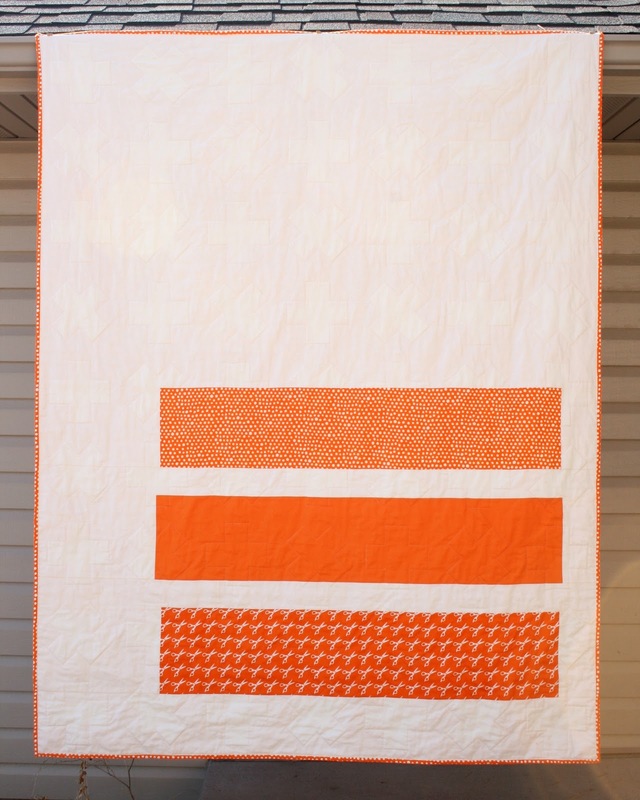 I love orange and this is fantastic Amanda Jean! Oh, my! This quilt is just stunning! This is really cool! Simple and striking. I love it! But you might already know that! WOW That is the most gorgeous orange quilt. Oh my! Love the bright color and that polka dot binding. Fantastic! I've had the same inspiration! Although I saw it as red. So my finished quilt is here: http://www.flickr.com/photos/kristiinaa/4872705384/in/set-72157621697317930. Love your quilt! That is such a fabulous quilt. 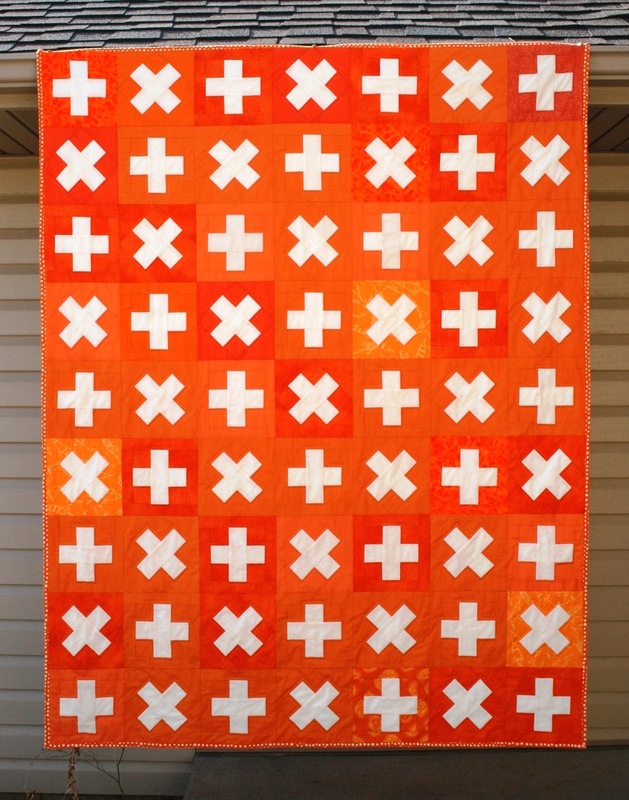 I love the simplicity of this quilt, the astethics, the simplicity!!! Stunning!!! What a great quilt! I love the back and the polka dot binding is way fun! Fantastic quilt. Simple design with clear colour. Brilliant. This quilt is fantastic!!!!!! I like it very much. I love the blanket and your quilt - it's gorgeous! Really cute and so fun. Ooh, I love this too and in the bright colors especially. I'm thinking orange and pink or maybe turquoise and orange. fabulous! I am such a sucker for 1)DOTS 2) a surprise when it comes to the back! WIN WIN!! Love the quilt. I have some of that scissors fabric too. In orange, black and white. Haven't used the orange yet because it was so bright. Now maybe I will. Thanks for sharing. What a gorgeous and inspiring quilt! Love the oranges! Awesome in so many ways!! Simple/bold design, fabulous color, and as always ~ perfect execution! Well done! That is a wonderful quilt nice and bright. I love the orange and the pattern!! It's so great that you took your inspiration and made it a reality. That is so bright and fun. My kids would love it. And I think it's so great that you noticed it and then were able to recreate the idea so well. Good job! Yet another quilt I want to make!! I am going to have to put your pattern on my wish list. I just love the things kids come up with, how fun your son named the quilt. stunning!! So amazing! I think this might just be my favorite quilt you've ever shared. This design and inspiration are right up my alley. Love it. Love it, the quilt back looks so awesome too. This is going straight to my Pinterest board. We are knee deep in math facts here so this was great! I asked my third grader what he thought it was about and he agrees 100% with the title. This is excellent. You are so incredibly prolific. How do you get so much done? I feel like I am doing well if I spend anytime at all in my sewing room. Utterly gorgeous!! I just love this :) In my favourite colour too! So bright and gorgeous. Glad you decided on that quilting, perfect! So beautiful and you gotta love Jamie Oliver!!! Very, very cool! Great gift idea for my math teaching SIL. Maybe just a mugrug size. Thanks for sharing. I love this, its so bright and bold! This is FAN-Tastic! I just love the different oranges - different enough to make the background interesting but not too distracting from the overall design. Wonderful! i love this quilt SO much, Amanda. Awesome quilt! I love the mix of oranges and the plus and X blocks. I especially love hearing how this one was named, which is perfect. Hope lots of people are buying your new patterns! I LOVE THIS!!! Love the way the different oranges glow, and love the back! And yours is SO much better than Jamie's! I adore strong colours, including orange, and wear them all the time, but I think if someone had suggested making a whole quilt in orange I would have thought not. Now I see yours and I realise that there are benefits to being brave in quilting as well as in my clothes! I have so many quilt patterns already but I NEED this one. Thank you!